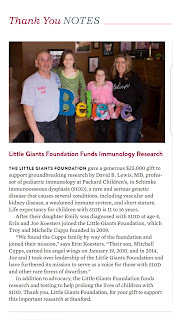 Little Giants Foundation: Thank You for Believing in Emily! Thank You for Believing in Emily! We are so fortunate to be recognized in the Packard Children's News that is put out by Standford Lucile Packard Foundation for Children's Health. It is because of you that we were able to send such a sizable amount for #SIOD #RESEARCHFUNDING!